When driving around the streets, the hope is that nothing bad will ever happen. That being said, vehicle safety is an important factor when choosing a vehicle especially for parents with small children. The staff at Philpott Pre-Owned Super Center want parents to be informed, in detail, about how to install child seats to keep their kids safe. The LATCH system that comes in vehicles is designed to make the process of securing and restraining children easier. 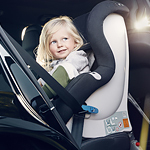 The system consists of a lower anchor that keeps the child seat secure on the low end and the tether that attaches at the top and keeps the child seat from pitching forward during a crash. Although child seats can be secured with seat belts, it has been shown that the LATCH system aids in increasing the likelihood that the installation will be done properly. Parents can check a vehicle's LATCH rating to make sure that the vehicle is the right choice for their family.